It’s been a long time since my last post, and since then, spring has definitely sprung around our place. 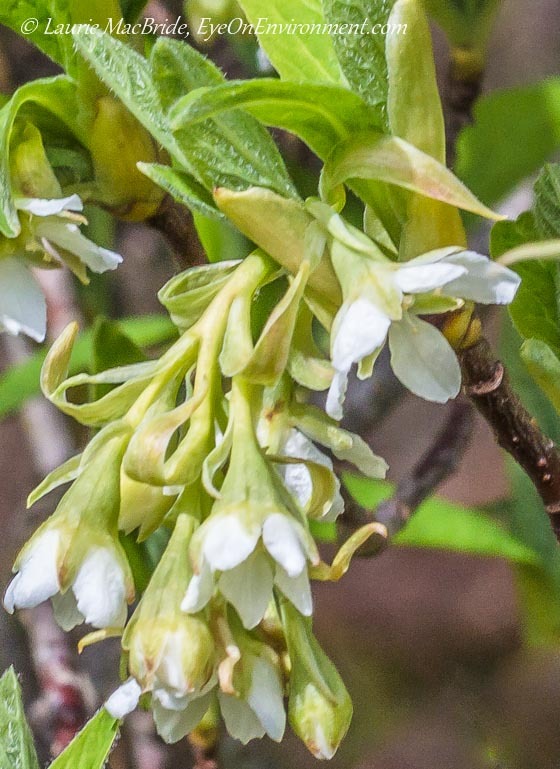 The best spot to witness this vibrant season in all its beauty, aroma and fast-paced action has been our “Picnic Tree” – a large, multi-trunked Indian Plum (AKA Osoberry, Oregon Plum or Oemleria cerasiformis). If you close your eyes and listen, the constant buzzy thrum all around your head makes it easy to imagine you’ve been transported to the centre of a busy beehive. But the insects aren’t the only active ones around here – I’ve been a busy bee too. I’m currently preparing 30+ prints for a new solo show, “The Coast Inspires Me”. All are coastal and marine-focused and almost half haven’t been shown before. They’ll be on display through the summer in a suitably nautical (and delicious) venue: the Silva Bay Restaurant & Pub on Gabriola Island, a long-time favorite of boaters, locals and island visitors alike. It’s set to re-open at the end of this month under the capable new management of Robert Stutzman (proprietor of the popular “Robert’s Place”), and I’m looking forward to some great meals there. I hope you’ll stop by as well over the summer to enjoy the food – and my photos! 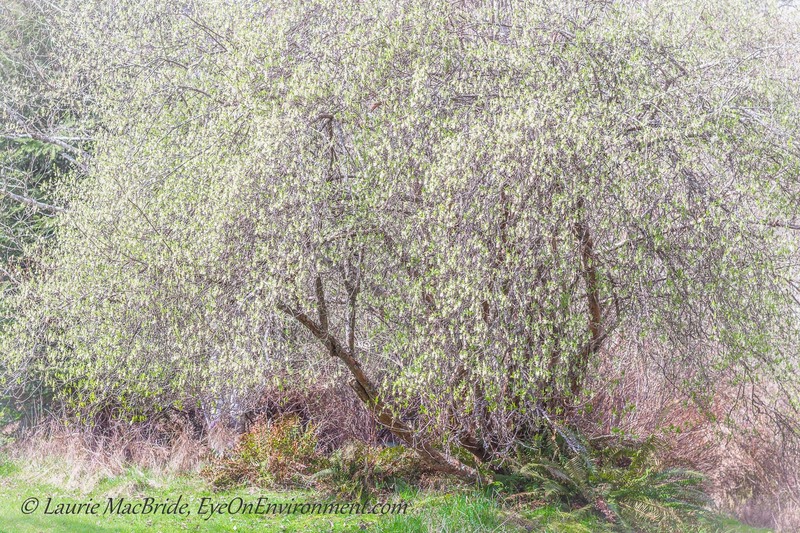 Posted by Laurie MacBride, Eye on Environment on April 11, 2014 in Garden, Insects & other invertebrates and tagged bees, busyness, flowers, Gabriola, Indian plum, nature, Osoberry, photos, spring, trees. How absolutely lovely, Laurie! We are more than ready for the coming nice weather, and this shot really speaks to that! Congrats on your new show, we hope it’s a complete success for you!! Thanks Toad! I’ve been busy this week hanging prints. The restaurant opens next week and as I mentioned in my post, I’m looking forward to some great meals there. Hopefully you and Mrs. Toad might get a chance to visit our island and check it out before the summer is over. Spring the sweet Spring! Our forsythia blooms first and is a golden sun outside our bedroom window. We have just planted a Kwantzan cherry and wait for its blooms and until it matches your lovely picnic tree! That sounds lovely, Paul…something to look forward to, for sure! We once planted a little ornamental plum, but unfortunately forgot that it needed deer wire around it in the winter when it had no leaves…so the local bucks rubbed their itchy antlers on it. Alas, it didn’t survive! Fortunately our Indian plum is old enough and multi-trunked enough to make it through such abuse. Love your PIcnic Tree photo and its delicate hues! It is like a painting. Thanks Hans! I always think it seems like an impressionist painting when I see the tree in flower each spring, so I”m happy to think I’ve succeeded in conveying that in the photo. The Picnic Tree shot is gorgeous Laurie!!! Thanks, Dirk! As you can imagine I’ve shot this scene many times over the years…never quite doing it justice!